Launched just over twenty years ago, the joint Geotail mission satellite is still operational and sending back crucial information about how aurora form, how energy from the sun funnels through near-Earth space, and the ways in which magnetic field lines move and rebound creating explosive bursts that rearrange the very shape of our magnetic environment. 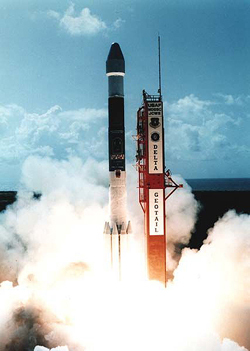 On July 24, 1992, the joint JAXA/NASA Geotail mission launched into space aboard a Delta II launch vehicle. It was the vanguard for a set of coordinated missions known as the International Solar Terrestrial Physics or ISTP project that studied the magnetic environs of Earth. Along with the Wind and Polar missions launched later, Geotail flew up into space to provide information about the way the magnetic envelope surrounding Earth, called the magnetosphere, responds to incoming material and energy from the sun. Twenty years later, Geotail’s instruments continue to function, sending back crucial information about how aurora form, how energy from the sun funnels through near-Earth space, and the ways in which magnetic field lines move and rebound creating explosive bursts that rearrange the very shape of our magnetic environment. To study the magnetosphere, Geotail’s orbit originally extended far out into the night side of the magnetosphere, through the long streaming lines of magnetic fields that trail away from Earth into what’s called the magnetotail. This early orbit stretched over 800,000 miles away from Earth at apogee, giving it an unprecedented view of the tail. After two years, Geotail moved into a new orbit that is somewhat unusual for a spacecraft – while it is an ellipse, it is a fairly squat one, and its nearest approach to Earth doesn’t comes particularly close. This orbit carries Geotail as close as 40,000 miles on one side of Earth, and out to about 120,000 miles on the other side. The orbit ensures that Geotail often crossed the borders of the magnetosphere at varying points around Earth. By passing through so many diverse areas around Earth, Geotail has provided scientists with much information about the location of certain events that were not previously known. For one, Geotail helped determine where in Earth’s environment explosive energetic bursts known as magnetic reconnection occur. These bursts, which result from fast changes in shape of magnetic field lines, are responsible, among other things, for sending particles toward the poles that cause aurora and for connecting incoming solar wind from the sun to our magnetosphere and transferring energy from one to the other. Determining the locations for where to expect magnetic reconnection, namely between 80,000 and 120,000 miles away from Earth on the night side, has helped guide decisions about orbits for future missions such as the Magnetospheric Multiscale (MMS) mission, due to launch in 2014, which will provide even more details on the physics behind magnetic reconnection. Geotail also helped confirm the location and mechanisms of how aurora form, observing initial magnetic reconnection in the magnetotail that corresponded to the appearance of aurora over the poles that in turn could be observed by the Polar mission and observers on the ground. Geotail observations also showed bubbles of plasma, known as plasmoids, shooting away from these magnetic reconnection sites down the magnetotail away from Earth. 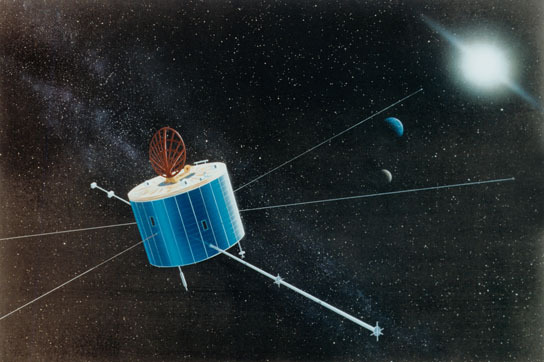 Geotail has another claim to fame: it was one of the earliest Japanese space weather missions, says Le, and many of today’s well-respected Japanese space scientists performed their early research on its data. Since 20 years of work have not dulled the capacity of Geotail’s instruments, it remains a useful observatory. With missions such as THEMIS (Time History of Events and Macroscale Interactions during Substorms), Cluster and Wind currently studying the magnetosphere, and missions such as RBSP (Radiation Belt Storm Probes) and MMS soon to come, Geotail can provide a complementary set of data at a remote location to show how events seen by one spacecraft in the magnetosphere can effect different regions. The GEOTAIL mission is a collaborative project undertaken by the Institute of Space and Astronautical Science (ISAS), Japan Aerospace Exploration Agency (JAXA), and the National Aeronautics and Space Administration (NASA). The Geotail spacecraft was designed and built by ISAS and was launched by NASA on July 24, 1992. NASA provides DSN support for the mission, which brings data down from Geotail, and performs initial data processing. The science data are processed and maintained by JAXA. Be the first to comment on "Geotail Satellite Still Sending Back Crucial Information after 20 Years of Service"